However, there is nothing relaxing when it comes to shopping for your first even guitar. You’ll soon find out that there is a staggering number of options to choose from. Even if you restrict your options on a single brand, you’ll be presented with different types of guitars with differences, so minute that you are not even sure if they matter at all. Faced with such a complex task of guitar selection, how can a novice guitar player such as yourself choose the excellent beginner guitar? 2.1 Don’t overspend on your first guitar. 2.2 The low action might be right for you. The answer to this question is actually very simple; you’re actually reading it right now. This list contains some of the best guitars for beginners you can find in the market today. We’ve curated this list just for you to speed up your decision-making process. 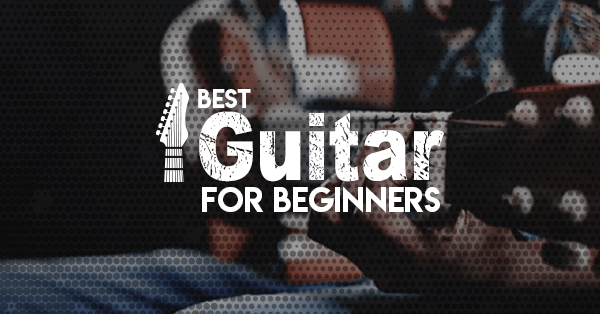 This list contains the guitars suited for beginner level players so expert guitarists may not be too impressed with the options here. There are guitars from different price points so most buyers with different budgets will most likely find the right one for them. 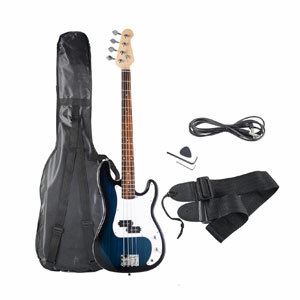 If you are looking for a good bass guitar, then the Safstar Electric Bass Guitar Full Size 4 Strings with Amp Cord Strap Bag Package for Starter Beginners is the perfect purchase for you. This guitar offers a good bass performance and, coupled with its affordable price, earns it a spot in this best beginner guitar 2018 list. Bass guitars mainly differ from regular ones in that they operate an octave lower. To give allow for the instrument to produce lower frequency sounds, you'll notice that the strings for these guitars are also thicker. In addition, you’ll notice that most bass guitars only have four strings. The Safstar is one such 4-string electric bass guitar. 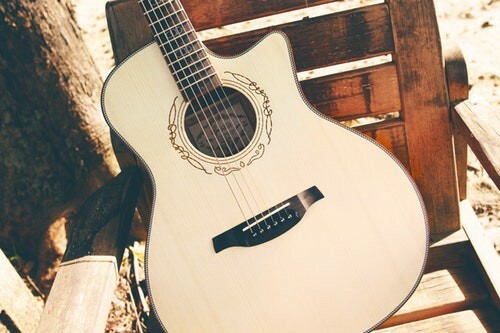 For improved acoustic properties, its head is made of maple, its body is paulownia while its fingerboard is rosewood. The set includes the bass guitar, a guitar bag, shoulder strap, amplifier cord and a guitar pick. The guitar is lightweight and durable, which makes it easier to carry to and from your practice location. The tendency for most buyers is to think that very low priced products must be of poor quality. While that would certainly apply to a majority of goods, there are always those outstanding products that will buck the trend. Products such as the Best-Choice Products Beginners 38'' Acoustic Guitar, a surprisingly affordable product of decent quality, which includes it to this top beginner guitar list. This is a 38-inch guitar specifically aimed for beginner-level guitar players. Surprisingly, it delivers a fantastic, clear sound thanks to its all-wood construction, smooth glossy finish, and its six steel strings. Unfortunately, the guitar is designed for right-handed players. It has an easy-to-use tuner and features a 19 fret fingerboard. Compared to other guitars, beginners will find the 38-inch acoustic guitar very easy to use. This is thanks to its low-action strings where players don’t need to press too hard in the string to form a fret which reduces hand fatigue. 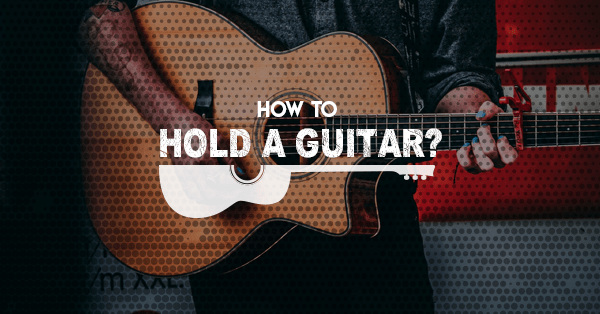 This makes it ideal for those who are yet to build hand strength needed for guitar playing. One more thing, this is the only package to purchase to be able to start playing right away. The set includes all the essentials to get started. 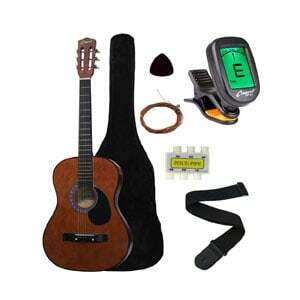 Aside from the guitar, there is a pick, a pitch pipe, nylon carrying bag, pick and extra strings. While the Crescent MG38-CF 38-inch acoustic guitar might be designed for beginner level students, it looks traditional design is attractive in an understated elegant manner. It’s wooden frame and steel strings give off that classy vibe and you’ll be forgiven for thinking that it costs more than its actual price. It has an onboard digital tuner, which means beginners will find it very easy to tune the guitar. Since the steel string acoustic guitar is one of the most common and versatile types, this guitar will suit with just about anyone and certainly makes it a strong contender for the top guitars for beginners. Sound quality is good and can be considered surprising when you consider its very low price. This fantastic sound output is thanks to its wooden construction. Overall, it gives a good value for your money and can meet the demands of a budding musical artist. 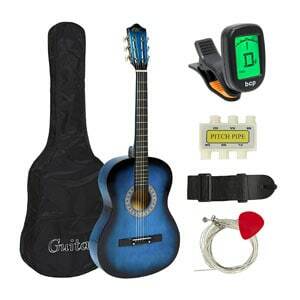 The set includes the guitar, the durable guitar bag, a digital tuner, extra set of strings, guitar strap and pitch pipe. By the way, the instrument’s orientation is ambidextrous so its compatible with both right and left-handed newbies. Both are back and neck is made out of linden wood while its fret is rosewood. 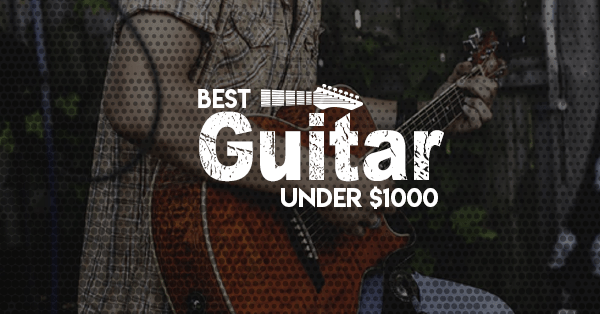 Do you think that a guitar that’s is considered the number 1 bestseller in the category would qualify in this best suited guitar for novice? We think so too and that’s why you’re seeing the Fender FA 100 Acoustic Guitar Bundle in here as well. Fender needs no introduction for guitar enthusiasts. They’ve been around and most likely, every musician owns a Fender or two in his or her collection. The Fender FA-100 sports that well-loved traditional look you’ll associate with full-sized dreadnaughts. It has a spruce top finished in natural gloss while its bridge and 20-fret fingerboard are made out of rosewood. The set also includes a clip-on digital chromatic clip-on tuner, which is very helpful for beginners when tuning their guitar. There is also a guitar picks, guitar strap, polishing cloth and an extra set of strings. 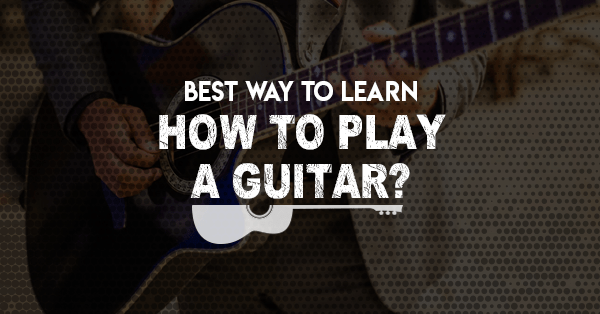 You’ll also find an instructional DVD to help you improve your guitar skills. 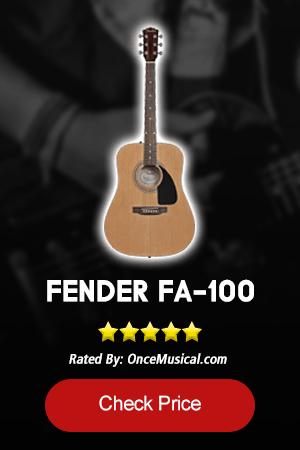 The Fender FA-100 lives up to the prestige of the Fender brand. The acoustic guitar delivers a rich full tone which is a testament to the expertise of the manufacturer in crafting high-quality guitars. The debate on whether nylon-string or steel-string is an ongoing one. Rather than taking sides, we believe that both types of acoustic guitars have their own advantage given specific situations. Ultimately, however, it is the personal preference of the guitarist which should prevail. Having said that, there are those who maintain that nylon-string guitars might suit some of those newer guitarists. The reason is simple, nylon strings are softer and therefore gentler on the fingers compared to steel strings. This would be a good choice for newer players who are yet to acclimatize their fingers to the strains of playing the guitar. If you have decided that a nylon-string guitar is best for you, then, we recommend the ADM Full Size Nylon-String Classical Guitar set. In terms of craftsmanship and sound quality, it qualifies to be included in the top guitar for new comers 2018 list. It has a classically styled body with a laminated spruce top finished in natural gloss. Both its sides and back are laminated basswoods while its neck is nato wood while the machine tuner is chrome covered. This is a complete set and includes everything you’ll ever need to start playing. 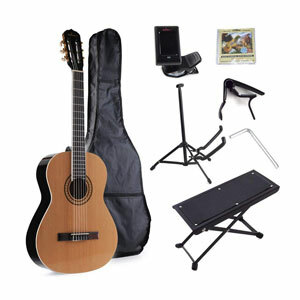 The set includes the guitar, an E-tuner, footstool. Guitar stand and Capo. Beginner level guitarists have different needs compared to pros. For this reason, a set that’s specifically designed with newbies in mind is better suited for players who are currently at this level of proficiency. 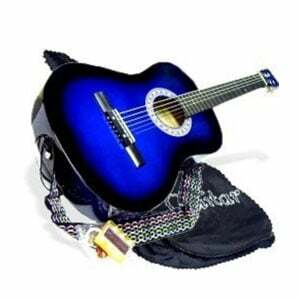 This is true for the LAGRIMA Acoustic Guitar Beginners with Guitar Case, Strap, Tuner & Pick Steel Strings (Blue). 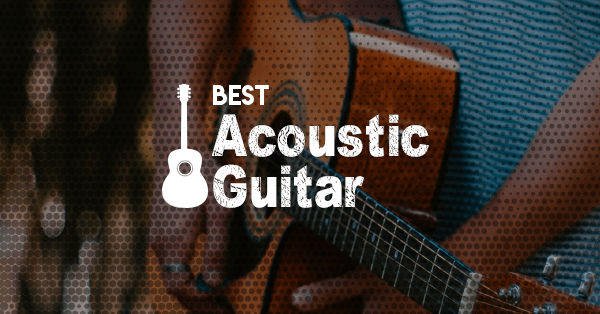 Despite its very affordable price, the guitar’s craftsmanship is exquisite and it is made from high-quality timber, a set that gives good value for money that qualifies it to land in this best guide of guitars for beginner 2018. Complete package includes the acoustic guitar, a nylon case, a pitch pipe tuner, guitar picks, an extra set of strings and a guitar strap. You don’t need a very expensive top-of-the-line brand for your first guitar. 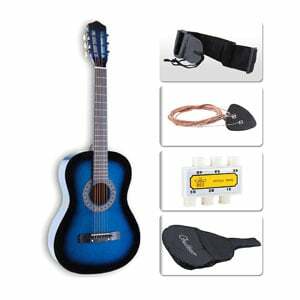 That is the basis for including the 38" BLUE Acoustic Guitar Starter Package, Guitar, Strap, Pitch Pipe & DirectlyCheap(TM) Translucent Medium Guitar Pick (BU-AG38) into this top guitar of beginner guitarist 2018 list. Directly Cheap specializes in bringing great deals and distinguishes itself as one of the best ways to buy musical instrument that is affordably priced. They were able to do this because of their business model that works like a wholesaler, they deal in huge volumes to give the best price available. There is nothing too outstanding with this set but, as a beginner set, it does its intended function well enough. 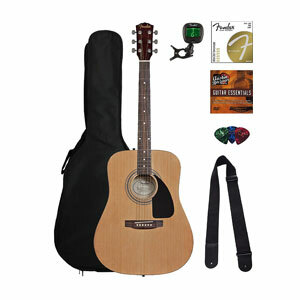 The set comes with a guitar strap, acoustic guitar Capo, extra set of guitar strings, padded gig bag, and guitar stand. The guitar has a beautiful high gloss blue finish. Its 38-inch size is the perfect size for the beginner to intermediate students. Donner is a relatively new brand established back in 2012. However, it was quickly able to establish itself as a manufacturer of quality guitars and ukuleles. 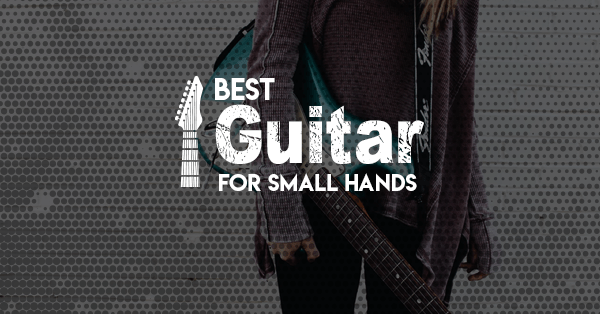 The Donner DAG-1C is its entry for the beginner guitar category, a high-performing music instrument that qualifies it to be included in this top guitar for beginner 2018 list. Donner’s product range may not be as extensive as other brands but the firm distinguished itself as a maker of impressive guitars that are surprisingly offered at affordable prices. 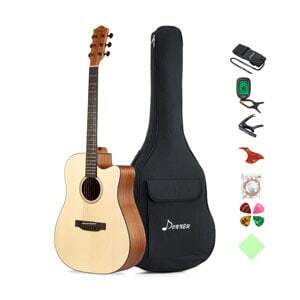 Donner DAG-1C Beginner Guitar Full Size is a 41-inch cutaway guitar specifically made for beginner level guitar players. It is sold as a bundle and comes with all the necessities to start playing. One setback for this guitar is that it is not made out of solid wood. Rather, Donner opted for laminate mahogany wraps for the guitar’s sides and back. The top is also made from laminate spruce. On the other hand, the neck is made from mahogany. The concern here is that the laminate may not produce the best sounds from an acoustic guitar compared to a solid wood. However, such difference will not be noticed at all by beginners. This full-size acoustic guitar has 20 brass frets. The complete set includes a guitar strap, Capo, extra strings, polishing cloth, picks, digital clip-on tuner, and a gig bag. Here is something that’s very important for all online purchases. Donner DAG-1C comes with a 30-day unconditional money back guarantee so its an added layer of protection for you. As a newbie to the world of guitar playing, getting the excellent guitar for new guitarist can be confusing for you. There is too much information regarding specs and there is also that concern that you might end up buying an overpriced but mediocre guitar. 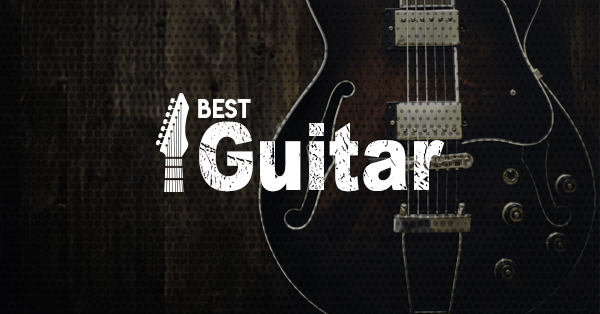 Which is why we’ve come up with this best guitar for beginner 2018 list to serve as a guide. In addition, we’re giving away some tips that might be useful when the time for decision making comes. Don’t overspend on your first guitar. 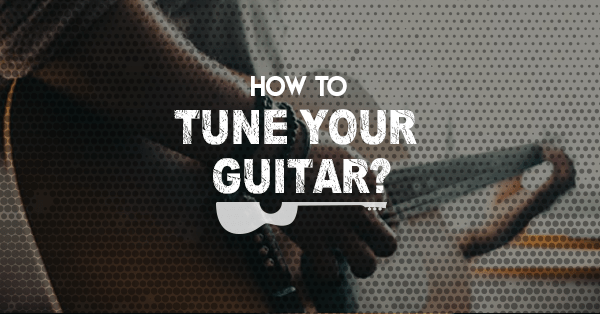 While it’s true that you might have to spend a little extra to get your hands on a quality guitar, you must set a limit when it comes to your first guitar purchase. In fact, there is no need to acquire a top-of-the-line guitar at this point at all. There are actually two reasons for buying cheap. At this stage, you are still practicing that buying a high-end guitar is pointless because you won’t likely notice the difference in quality anyway. Think of it as a guitar solely used to hone your guitar skills. It will be a very overused guitar and you’ll likely drop if a few times down the line. Paying top money for such guitar will be too extravagant. The other reason is that you’re not too sure how long your interest will last. We’ve all experienced those moments where we are very passionate one moment and totally unmoved the next. It is possible that your passion in guitar might just be a passing fancy. Paying too much for a guitar that you won’t be using much is simply a waste. The low action might be right for you. When it comes to the distance between the strings and the fretboard, it might be better for beginners to choose a low action guitar or one where the distance between the two is shorter. 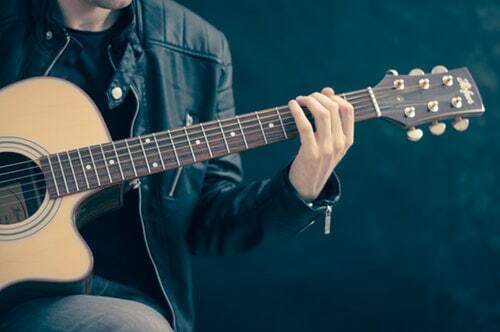 With a low action, you won’t have to spend so much effort in pressing your fingers to form the chords which means your fingers will not be overworked. 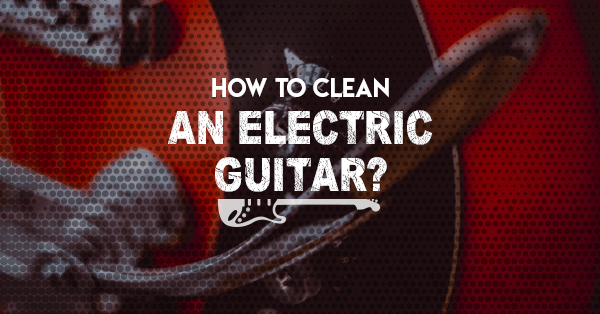 Decide beforehand whether you want an electric or acoustic. You might have heard by now about the pros and cons for each type of guitar. We won’t be touching that here. The point is that you need to choose the type of guitar based on the type of music you prefer. 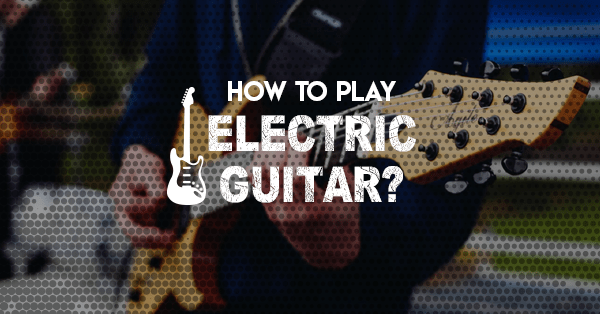 If you plan to play a lot of hard rock or heavy metal, it’s a no-brainer that you should choose electric for the overdrive and distortion effects. 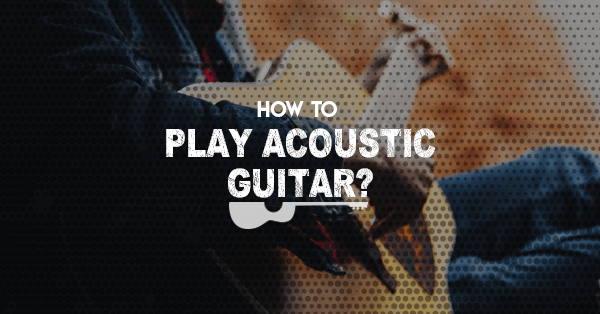 Otherwise, choose an acoustic for if you plan to play ballads or slower music. Choosing your first guitar can be considered a milestone in your musical journey. However, don’t be too pressured. A first guitar is just a tool that you will need to hone your craft. As long as you practice hard, you’ll soon outgrow your first guitar anyway. 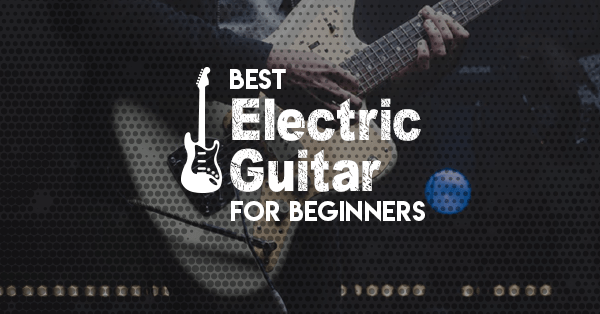 Just follow the tips in this list or, better yet, choose a guitar that’s included in the excellent guitars for beginner list.